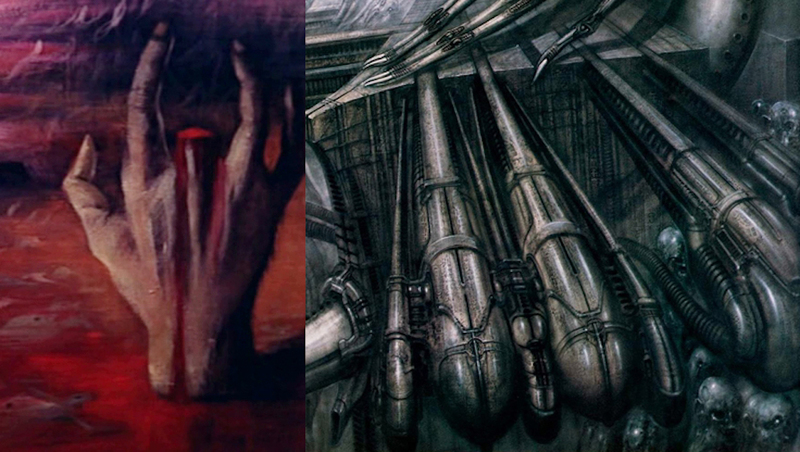 Alien Explorations: Giger's Alien Monster III references the painting from "The Creeping Flesh"? the painting from "The Creeping Flesh"? painting from "The Creeping Flesh" and Giger's "Alien Monster III"
The painting from 'The Creeping Flesh"
a) On 21st May 2016, I took a look at the film The Creeping Flesh (1973) made at Shepperton studios, since it featured a huge monstrous non-human but humanoid skeleton. 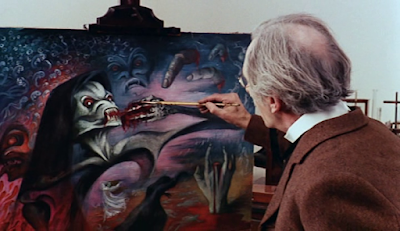 The beginning scene showed a strange painting appeared to be inspired by Surrealism, that would be shown as a forewarning of what would be experienced later in the film. The character Emmanuel Hildern would break off a finger of the skeleton once he noticed it had grown flesh after being subjected to water. 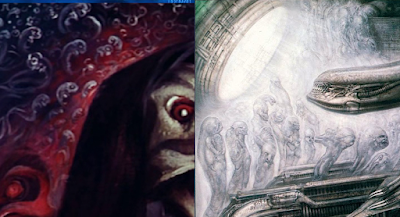 The girl in the white dress dancing at the bottom of the painting would represent his daughter who would go crazy in the film after being experimented on with material from the creature's own body cells. 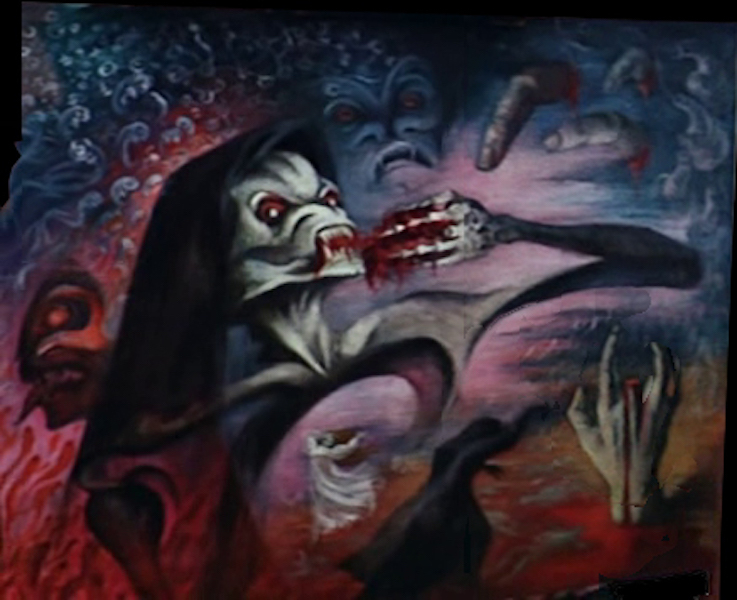 A shadowy figure at the bottom of the painting might represent the creature dressed in a black robe. 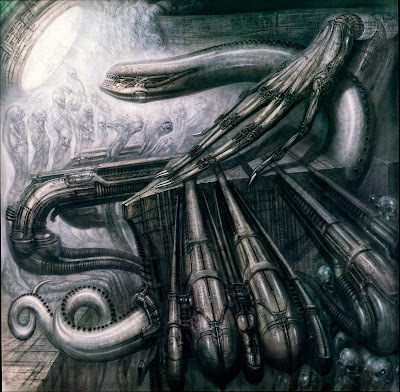 I suddenly had an idea that Giger would have seen this and wanted to use it as reference for one of his paintings. d) The fetal forms float in the air and become these demons in sausage skins. 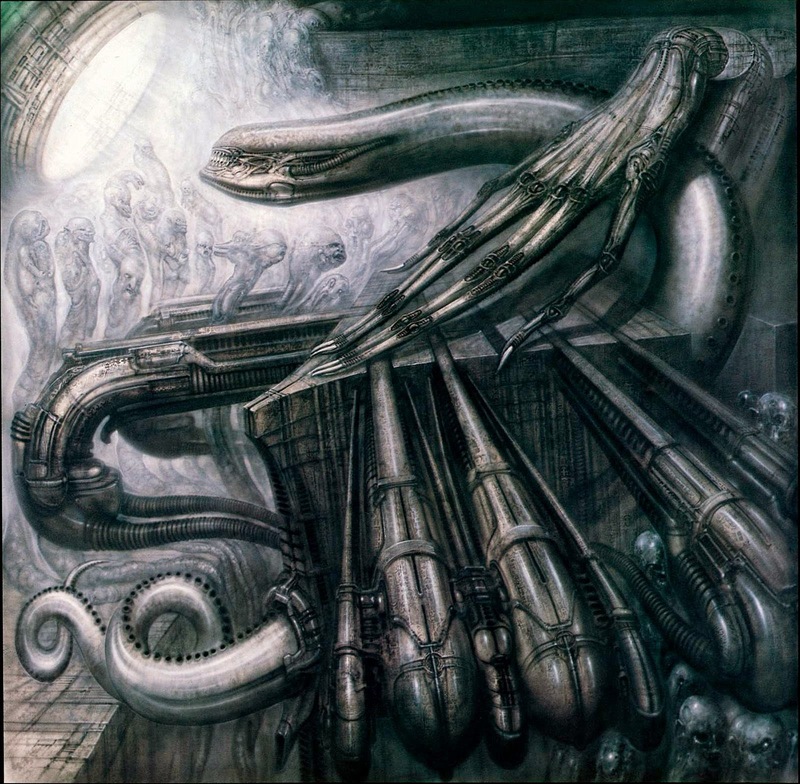 e) Giger's Alien Monster III, that appears to reference Max Von Moos' Devil's Kitchen, the album cover for Tomita's album The Bermuda Triangle and the painting from The Creeping Flesh.